What's Next for the Dollar and Gold? Who would have predicted oil prices in the sixty-dollar range a year ago? Something is not right about these markets. Our take: don’t get burned when markets add fuel to the fire. Here’s what to watch out for as we head into 2015; ignore at your own peril. Europe can’t get back on its feet with sanctions imposed on Russia (hint to European Central Bank head Draghi: printing money can’t fix this). China’s economy is in transition with significant headwinds coming from a housing bubble that’s deflating. In the U.S., we are made to believe our recovery is getting ever stronger; the energy markets appear to disagree. The large moves we have seen in some markets of late – most notably in oil futures – may well also be a reflection that banks are no longer “risk takers” in these markets; the law of unintended consequences has removed these very large liquidity providers. Investors shouldn’t be surprised that moves have become more volatile. The media attributes the drastic drop in oil prices to OPEC’s decision not to limit production. OPEC’s meeting last week might have been a catalyst, but fundamentals did not change radically enough to justify the dramatic decline. Some say commodity prices tend to be driven more by technicals, and we don’t disagree. We take it a step further, though, arguing all markets are ever more removed from fundamentals. What’s happening in the oil markets is a symptom of what’s happening in all markets. Our long-term readers know that we have been most concerned about complacency in the markets: complacency is the absence of fear. In the equity markets, the VIX index measuring volatility is a good barometer of complacency. In our analysis, complacency on the backdrop of rising asset prices is a problem. It’s a problem because investors bidding up such asset prices are not appreciative of the inherent risks they are taking on. As fear comes back into the market, such investors can be gone in a heartbeat, as they suddenly realize their investments expose them to greater risk than they bargained for. In our assessment, an equity market that has relentlessly risen on the backdrop of low volatility is a box of tinder waiting to be lit. Volatility has crept back into the markets, although casual observers might not have noticed. First, there was the equity market that briefly acted up in late September / early October. Pundits write this episode off as old history. Indeed, even we said a possible market crash is put on hold after Japan announced its $1.2 trillion pension fund would invest hundreds of billions in foreign equity markets. As we wrote in a recent analysis, this policy may only provide short-lived support to the markets and be ultimately a net negative for Japanese investors. Since then, other markets have thrown mini-tantrums. Be that in the currency markets where we’ve seen big swings in select currencies to the commodity markets. But while the Russian ruble has been on a nosedive and other commodity currencies have suffered in the most recent bout, the spikes in volatility have not always been in the most obvious places. To us this suggests not all is well in the markets. And then came the rout in commodities, at first also pulling down gold. But gold – at least as of this writing – is staging a furious comeback. And conspicuously absent: a correction in the S&P. To understand why, consider that the global storyline has been that the U.S. is the one place in the world that’s recovering. Investors around the globe see the glass half empty, but have been told that there’s this one place where the glass is half full. And sure enough, they buy US equities, pushing up the U.S. dollar in the process. And why not, the Fed is the one central bank that’s embarking on a tightening course. Except that we think foreign investors are the new retail. Retail investors have long left this market; some say we can’t have a market top if they haven’t joined the frenzy. Trouble is, they have no money to join the frenzy. But foreign investors were not only late in gobbling up toxic Asset Backed Securities (ABS) in 2007, they have bought into conventional wisdom, driving U.S. equity prices higher in recent months. •	As volatility is making the rounds in currency and commodity markets, it may only be a matter of time before it reaches equity markets. When it happens, brace yourself, as the long overdue correction may finally take place. The longer it goes the more likely a correction turns into a crash. •	The Fed has already been back peddling on its hawkish talk. In the meantime, forward inflation indicators have plunged – including those that ought to be less sensitive to changes in commodity prices. •	The U.S. was the only major country that was expected to tighten. If this needs to be re-priced, it could bring the greenback back to earth. •	Note that in recent months, higher equity prices have been correlated with a stronger dollar. Conversely, do not count on the dollar playing “safe haven” currency if the equity market tumbles. •	The ECB is now aggressively talking about QE now that forward inflation expectations have come down. Trouble is that even if the ECB were to buy sovereign bonds, it is doubtful that it will be enough to increase those inflation expectations. What Draghi needs is to have fewer geopolitical headwinds. Those may well come as German chancellor Merkel has made some first comments that appear to be aimed at diffusing the standoff in Ukraine. Aside from lackluster demand, European banks continue to have some challenges; Super Mario (Draghi) can help, but not work miracles. 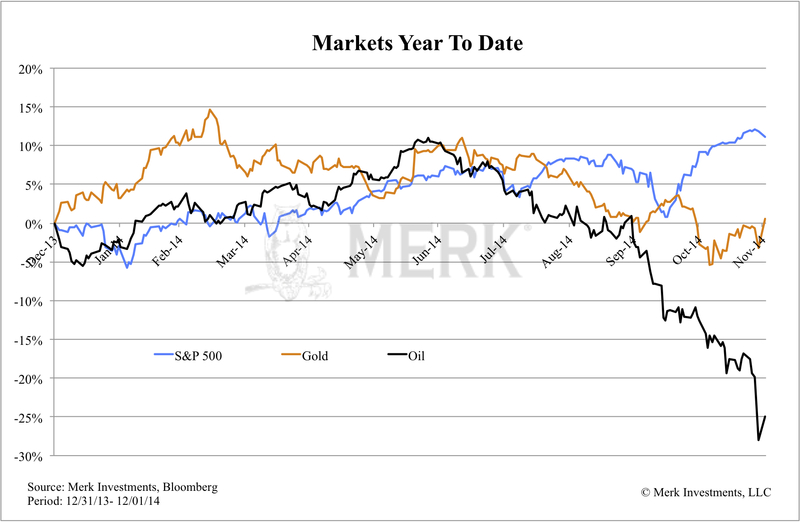 •	Gold has had a low correlation to equity markets in the long-term. We continue to believe investors consider gold as a diversifier in an era when real interest rates are negative and may well continue to be negative for some time. In fact, we have repeatedly said we don’t think the U.S. can afford positive real interest rates for an extended period – not now, and not a decade from now. Negative real interest rates are supportive to the price of gold, as the shiny brick pays no interest - which may be better than losing money on a real basis holding the greenback. •	Japan’s economy is a hopeless case, but Prime Minister Abe is doing his best to accelerate Japan’s demise. Having said that, the Japanese yen could well have a substantial rally even if our long-term outlook is very negative. Although we note that the yen has shown very little motivation to rally on minor corrections. We don’t look at the yen as a ‘safe haven’ currency anymore. Instead, when the yen rallies in a “risk off” environment, it’s a sign that people have lost faith Abe will pursue his policies; the moment investors believe Abe is powerful enough to pursue his agenda, the yen appears to lose any ‘safe haven’ characteristics. As such, we remain rather bearish on the yen. •	With regard to other major currencies, their central bankers have all tried very hard to talk them down. In Australia, barely a day appears to go by without some official saying the Aussie is overvalued. How much jawboning can the markets take? The Aussie’s fate will ultimately depend on how China is doing, not words of policy makers. •	China’s economy has been weakening. However, given that China has a current account surplus, we do not equate a weakening Chinese economy with a weakening currency. Quite the opposite may well happen, just as in Japan – formerly with a strong current account surplus - the yen used to appreciate when there were bad economic data. China is going through a major transformation. Much of the Chinese yuan’s fate may well depend on how the central bank will play its hand. For now, yields in CNY denominated securities are much higher than in the U.S.; with the U.S. stepping back on its tightening bias, relatively high yielding CNY denominated assets may continue to be attractive. In summary, as we look ahead, this may well be the time to be cautious. Investors continue to be scared that they might miss another rally. Indeed, late phases in a bull market can lead to spectacular gains. The temptations are certainly there. As John Hussman has said: you can either be a fool before or after a bubble bursts. To us, this means only put money at risk you can afford to lose. Except, of course, that there is no place to hide when real interest rates are negative, as cash is at risk of losing its purchasing power. Investors may want to look at investing the way institutional investors do: they have a risk budget. Look at what your risk budget is, then allocate it wisely. Look for true diversification. For more on our 2015 outlook and how to prepare for what’s ahead, please register to join me on Thursday, December 11, for our Webinar. In the meantime, follow me on Twitter at twitter.com/AxelMerk for my most up-to-date thoughts on the dollar, currencies and gold. If you haven’t done so, also make sure you sign up for Merk Insights to receive analyses like this one straight to your mailbox.